Successfully diagnosing a headache gets complicated. This is because more than 130 distinct disorders have been identified along with over 300 triggers. 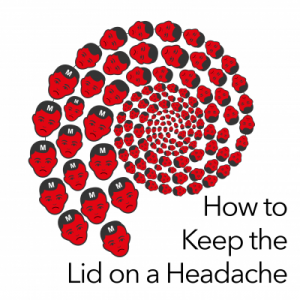 This is what makes a headache almost as unique as an individual. You can also simultaneously suffer one or more types of headache or a migraine at the same time. One may cause another or they can overlap with each other. These are known as mixed or multi-source headaches. They can take longer to resolve as your therapist works through treating the different causes. For example, a painful neck can cause an increase in surrounding muscle spasm, which will increase your blood pressure. As a result, you could have a cervicogenic (neck) headache, with a tension headache and a resultant migraine! However, if you suffer from headaches more regularly, there is some good news. Two of the most common headaches, tension-type headaches and cervicogenic (neck) headaches can be significantly improved. You may even find them cured by physical therapy, both in the short term, as well as the long term. Manipulating or mobilising your neck can be hugely beneficial in eliminating your headache. Or at least it helps in reducing the intensity and duration of the headache. Soft tissue work including trigger point therapy and massage can be effective. This works by relieving spasm in the head and neck muscles which may contribute to your headache. You may also find help you cope better during headache episodes, by reducing associated stress and anxiety. Acupuncture can help with neck or cervicogenic headaches, and sinus headaches. Some people have found this to be more successful than drugs at reducing the frequency and intensity of migraines. In addition, poor posture and repetitive movements in your daily life, have also been shown to increase the risk of experiencing headaches. This is because poor habits can cause muscle imbalances, muscle weakness and strain the ligaments and soft tissues in the joints of your neck. In these cases corrective exercises to strengthen weak muscles and stretch tight muscles can be extremely effective. Postmenopausal Women: Are You at Risk?